Dimensions: 6-3/4 x 8-1/4 in. Includes 10 cards, 10 laces, full-color throughout, ages 3 and up. 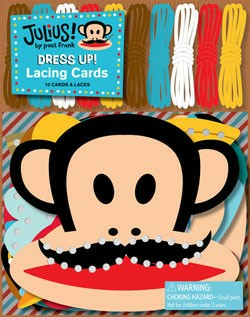 Lace up these colorful cards to dress up Julius and his friends! Kids will love adorning these 10 hole-punched cards with 10 multi-colored laces to dress up their favorite Paul Frank characters. Durable and reusable, these lacing cards encourage hand-eye coordination and help develop sequencing, dexterity, and motor skills. Printed on thick, sturdy board, they are perfect for small hands to hold and are equally suited for hanging on the wall in a child's room.